But if we genuinely want to help organisations succeed we cannot ignore the difficulties that resource efficiency poses. On the one hand we have seen earlier the considerable savings that many large organisations have achieved as a result of closer attention to energy and other resources. The value really is there, and some organisations have crafted programs that are genuinely transformational and sustained for the long run. Yet at the same time research such as that by McKinsey shows that there is a huge amount of further improvement possible and it is evident that at a macro-economic level we are still some way from decoupling energy use from growth globally. The big picture evidence is much more ambiguous about our rate of efficiency improvement. For those who have been engaged in resource efficiency for some time these contradictions come as no surprise – for most programs do deliver significant value but they also fail to progress in the long-run. 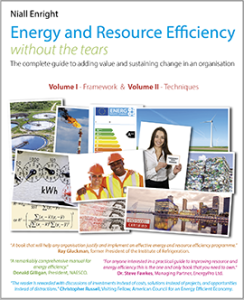 The corporate case studies and literature give the impression that resource efficiency is easy and that in every case for every organisation it has been a resounding success. Yet we all know that no business strategy works all the time. In fact this overly rosy picture of resource efficiency programs is in itself likely to lead to scepticism and disillusion when a new generation of individuals and companies seek out to capture the latent value, only to find that it is not as easy to realise as expected. The emphasis on difficulties is not intended to dishearten organisations or individuals who are about to set out on the path of greater resource efficiency – for the journey can be thrilling and rewarding – but rather to provide a much finer resolution road-map to guide the user around obstacles in the journey and so assure a more enjoyable and value-generating outcome. Essentially we need to pay careful attention to the design of our resource efficiency programs if we want to be in the third or organisations that succeed. Because resource efficiency is a process, we can describe its key characteristics. We know that it has continuous improvement at its heart; we know that it requires management focus and that it can embrace a wide range of activities within any organisation. We understand that there are many sources of value so we need to engage many teams in realising the full potential for our organisation. We know that informed decision-making at all levels is important, and that the process involves change management so it extends beyond mere technical fixes. We believe that management commitment is important, and that a clear linkage with value is necessary – at least in the private sector – to provide a justification for action. To address the challenges and complexities of resource efficiency, this Handbook introduces a simple resource efficiency Framework which breaks down the resource efficiency process into a sequence of activities. At the centre of the Framework is “Value”. Value describes the monetary worth of private companies, reflected in the interlinked elements of profit, equity price or asset valuation. Value also includes the notion of service effectiveness for public sector or not-for profit institutions, which may mean simply increasing the capacity for service provision by reducing costs; or it may mean delivering a better quality of service or meeting the wider needs users. In essence Value is shorthand for the principal measure of attainment of the organisation’s core purpose. The Framework set out here is based on experience gained in the implementation of many hundreds of programs in industrial, commercial and public sector organisations over a period of 25 years. It is intended as a profoundly practical guide to help design and implement a resource efficiency program that will achieve its objectives. In keeping with the notion of resource efficiency as a process, the Framework is task-oriented, outlining a natural sequence of activities which will help ensure success. The Framework can be applied at any scale, from a single facility through to a global operation and is suitable for all types of organisations: public or private, profit or socially driven, service or manufacturing. 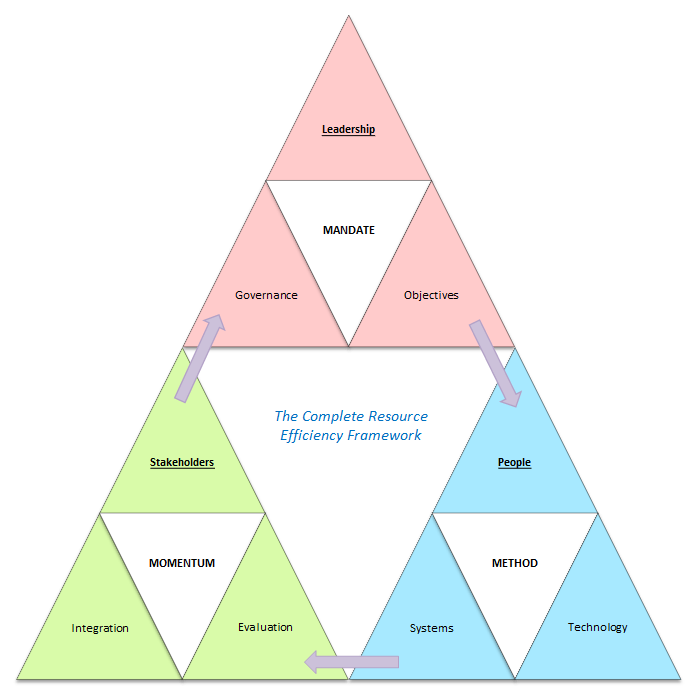 The Framework is conceptual rather than prescriptive: that is to say organisations are free – in fact encouraged – to adopt different terminology or use different methods for individual elements of the Framework – perhaps because they are using a standard like ISO 50001 or integrating their approach with a quality system like Six Sigma. The key is that that the Framework describes the components of a successful program, such as management commitment, which should be present in any approach to resource efficiency. At its simplest the Framework is a check-list of best practice and a tool to diagnose – and hopefully remedy – factors that are impeding success. The Framework process has been carefully designed to achieve two objectives – to maximise the value that the resource efficiency program can deliver and to overcome or minimise the barriers to resource efficiency that may exist. The techniques and processes that form the Framework have been honed and refined in the field, in hundreds of sites worldwide – this is not a theoretical toolset, but rather a distillation of the most successful techniques in use today. For each element of the Framework we will explicitly examine why a particular approach increases value or overcomes obstacles, in order that the critical thinking behind the design is understood, and can be applied to the shape of an organisation’s own program. Above all, the Framework is intended to offer a common sense approach to resource efficiency. We start off with the proposition that we need three fundamental things to make our program a success: we need a mandate for action, we need a method or process for engaging our organisation in the necessary changes and we need to ensure that sufficient momentum can be created to ensure the program persists and develops over the long-term. Although each of these may require markedly different levels of effort, no program will prosper unless it has all three: the absence of a mandate means that the program is unlikely to receive the necessary resources or attention; the lack of a method means that outcome is likely to be more expensive and less effective than expected leading to disappointing results; while poor momentum means that the program is likely to decline when the next initiative comes along or when premature victory is declared following initial success. The three parts of the Framework are largely implemented in sequence: mandate leading to method leading to momentum, as shown in the illustration above. However while each step needs to anticipate the next, one can step backwards in sequence to change or modify a process based on learning, and the mandate need to be renewed on a regular basis hence we return to the beginning of the cycle. Placing Value at the heart of the process reminds us that at every stage of our program we need to demonstrate the benefits that the resource efficiency efforts are producing. We shall consider later the importance of aligning the resource efficiency program with the primary objectives of the business but it is worth noting now that it may be more acceptable for not-for-profit institutions to replace the word “Value” with one that reflects the core mission of the organisation such as “Learning Outcomes” or “Service” or “Patient Care”. For-profit organisations may also want to apply terminology that matches the current corporate imperative: “Earnings per Share”, “Profit” or “Brand”. How does the Framework fit with existing business processes? For example businesses will almost certainly already have a corporate strategy and short and medium term plans. Organisations will have well-established budgeting processes whereby specific objectives are discussed and approved at an operating or departmental level and money and resources are allocated. Organisations may have already have quality systems such as Six Sigma, TPM or Lean Manufacturing; as well as environmental standards such as ISO 14001 or 50001; they will have and capital allocation processes which may consider some non-financial criteria; they may have management and employee incentive schemes; they may have formal processes to ensure environmental compliance – all of which are relevant to a resource efficiency program. Inevitably resource efficiency will be just one of a number of objectives that an organisation wishes to achieve and so they will probably not wish to treat it as a special case and certainly not radically re-engineer current systems that serve a variety of purposes. The Framework should not be taken as an alternative to the existing systems used to run an organisation, but rather as a means of ensuring that these existing processes are providing the necessary support to the resource efficiency program. The Framework should also indicate how the existing processes can be connected together to achieve the resource efficiency goals, as well as areas where existing processes could be further developed bearing in mind that changes to existing systems should only ever be proportionate to the value that they bring. In the Framework we will describe a number of specific tools – such as an opportunities database and monitoring and targeting– which help drive the continuous improvement process. 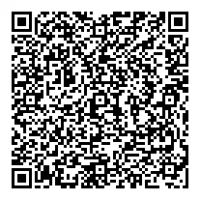 Ideally these tools will either be in place today or can be incorporated as refinements of existing business processes. Under the heading Momentum, later in this Handbook, we will explore the need to integrate the resource efficiency program within the current organisational systems. The intention is that we embed the processes, behaviours and tools of resource efficiency into the “the everyday way we do businesses”; in just the same way as we align resource efficiency to the core measure of value that drives the organisation. So the resource efficiency program should work largely through existing decision-making processes – perhaps by widening the input information that governs decisions. What we want to avoid at all costs is a separate “cottage industry” of effort remote from other business processes, which will inevitably be discarded at some point in the future because of its lack of connection with what is perceived to the organisations core. Figure 57 The Resource Efficiency Program Framework. 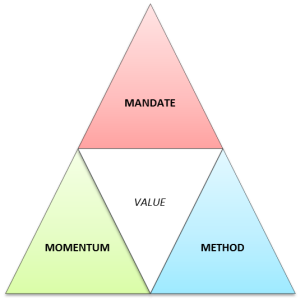 The three high-level components, Mandate, Method and Momentum, each in turn have three further interlinked elements. A successful program will address all 9 elements during its evolution. Within each of the three high-level components of our Framework – Mandate, Method and Momentum – there is an element indicated in underlined bold text – Leadership, People and Stakeholders. These are the usual initiators of our resource efficiency program – for example the impetus could arise because of the needs of an especially influential stakeholder, e.g. Walmart requiring change from its suppliers; or it could come about because a particular group of employees have identified a value-creating opportunity, such as the marketing department in L’Oreal; or because a member of the leadership team, such as the Chairman, CFO or CEO, believe that resource efficiency is a valid focus for the organisation. Regardless of whether the case for resource efficiency originates inside or outside the leadership team, the sequence of Mandate, followed by Method and Momentum is recommended – thus early engagement of Leadership to craft a Mandate is always desirable. Of course organisations are complex things and it is not expected that every resource efficiency program will start with an all-encompassing mandate. In many cases organisations are simply not set up for that type of approach – examples would include conglomerates where businesses are run as separate entities or organisations where the facilities are effectively in competition with each other (as is often the case in automotive plants). It is quite common that a resource efficiency program is limited in scope to a Business Unit, Division, Branch or even a single site – in this case the same cycle of Mandate, Method, and Momentum will apply, but oriented to the leadership, staff and stakeholders at that operating level. In a similar vein, where a large corporate resource efficiency Programs is being deployed, with its “three M’s”, it is anticipated that the process of engaging each site or business unit will also break down into discrete Mandate, Method and Momentum steps at the lower level. This is often the case where a high-level Mandate for action results in an initial pilot program, where the elements of the program can be tested, developed and appraised in a controlled fashion, prior to wider deployment. Thus we should think of the Framework as being capable of being replicated at multiple levels of an organisation – in other words a Corporate Program and Mandate is reflected in a relevant Site Program and Mandate, which in turn is reflected in individual Departmental Programs and Mandates which may differ in elements such as scope or Method reflecting the different circumstances in each Department. Those familiar with change management methodologies will probably spot the similarities between some of the leading models of change and the elements in the Framework that are set out in this Handbook. This should come as no surprise given the view that a resource efficiency program is essentially a change management program. It is somewhat encouraging to see the close parallels between the Framework, which is entirely based on pragmatic best-practices observed in resource efficiency – particularly in energy efficiency and waste minimisation programs – and the leading thinking in change management. In the course of this chapter and further Chapter 5, we shall explore these parallels further to see what the leading methodologies for change mean for resource efficiency change and the insights that they offer into achieving success. Note: Part 2 of the Handbook goes through these nine different elements in the framework.